Article Mirrored from Natural News.com (in black) with my comments in RED. Just to preface this article, the Vatican is at the center of a world wide conspiracy theory, dating back to Adam and Eve. The Vatican is the Antichrist; a deceptive cult of satanic occultists and paedophiles. The Antichrist is the mirror opposite of Christ. The eyes are the mirror to the soul, and these are not kind eyes. In their deceit they are unimaginative liars. To understand what they mean, just take every major word and either apply its antonym or it’s strengthened meaning. These people in the Vatican, and elsewhere are communists, fabian socialists, malthusians, marxists, and every other nasty group of tyrants known throughout history. These tyrants work together in government and non-government (NGO’s) throughout the world to bring about their common agenda. This agenda is World Government and the United Nations Agenda 21, a forced de-population program. In other words democide, which is genocide committed by government. The symbols used in the Vatican, if studied will reveal the true history and thinking behind these people. For instance, in Christianity the cross is at the top, whereas on the Pope‘s chair the cross is inverted. 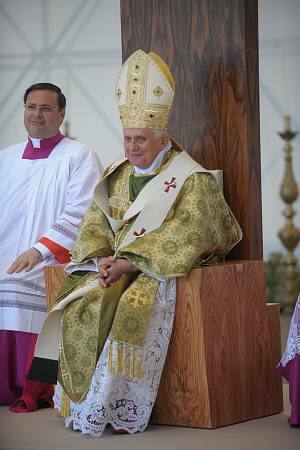 The public pope wears a white robe. The private pope wears a black robe, just like the Judges who sit in our courts. When Courts of Justice deny people justice (trial by jury – legem terrae or common law) they are committing a judicial act. Today in Australia we have Star Chambers which is trial by judge. To find out what is happening today in and to Australians view the contents on this website http://australiatoday.webs.com/thesecretcovenant.htm and always remember to follow up with your own research. BE WARNED: They plan to place a RFID chip in everyone. They will be able to control your money supply which means they can cut you off and steal from you, they will be able to tell where you are at all times, and if you don’t behave, the cyanide within the RFID chip will be remotely released (yes, someone has a patent on this). DO NOT ALLOW THEM TO PLACE AN RFID CHIP IN YOU. To find out more read David Icke’s book “The Biggest Secret”. (NaturalNews) During a recent speech he made before the Pontifical Council for Justice and Peace in Rome on December 3, Pope Benedict XVI, the current leader of the Roman Catholic Church, called for what can only be described as a unified world government, which he dubbed a “new evangelization of society” that aligns with the spirit of visions brought forth by previous popes. While addressing the council, Pope Benedict XVI made numerous references to this “new evangelization” as an integral part of the Roman Catholic Church’s world mission. And when defining what this phrase actually means, Pope Benedict XVI spoke about how individualism must be transformed into a type of communalism marked by interconnectedness and “family formation” on a global scale. Part of this entails the “construction of a world community,” as translated from the original speech, which was given in Italian. And to guide this world community will be a “corresponding authority” whose purpose it is to serve and promote the “common good of the human family.” In other words, a “New World Order,” in no uncertain terms, is the ultimate goal of the Roman Catholic Church. Pope Benedict XVI is not interested in just any New World Order, however. He made it clear that the Roman Catholic Church’s responsibility is to guide those who are actually bringing about this world government in how to promote an “anthropological and ethical framework around the common good.” Along with this, will be a comprehensive reform of the corrupt international monetary and financial systems, of course in line with Roman Catholic doctrines. Such language may initially sound benevolent to some, but what does it all really mean? 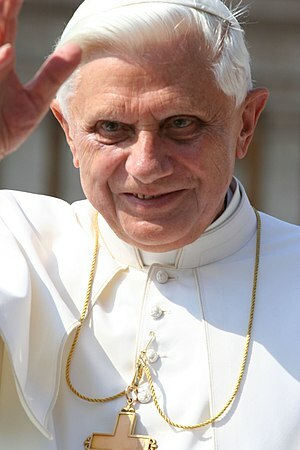 Based on the Roman Catholic Church’s sordid history of consolidating power and mandating its religion on societies through a blending of church and state, it is hard to call such a proposition by Pope Benedict XVI anything other than a call for a dictatorial New World Order guided and controlled by the Roman Catholic Church. “These latest remarks made by the Pope and the Catholic Church come as no surprise considering that in 2010 the Catholic Church sought the establishment of a new Central World Bank that would be responsible for regulating the global financial industry and the international money supply,” wrote Andrew Puhanic from Activist Post about Pope Benedict XVI’s latest speech. This entry was posted in News Archive and tagged Agenda 21, Catholic Church, criminal, dark knight, deceit, decode, fraud, freemason, hypocrisy, illuminati, Julia Gillard, mk ultra, Nazi, New World Order, Pontifical Council for Justice and Peace, Pope, Pope Benedict, Pope Benedict XVI, Rome, trojan horse, World Government by renaissancelearningfoundation. Bookmark the permalink.